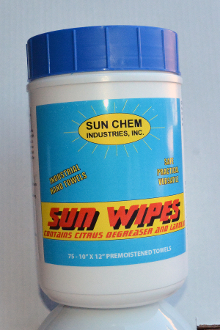 THESE ARE SUN CHEM'S #1 WATERLESS HAND WIPES. These pre-moistened dual-texture towels not only can be used to clean hands but also can be used on clothing, upholstery spot removing, and most all other surfaces. The unique canister fits where others will not and it is effective in limiting moisture loss. One canister contains 75 towels. Heavy-duty, hand scrubbing towels containing special biodegradable citrus hand cleaner detergent that is non-irritating. Waterless, disposable towels are perfect for use anywhere, anytime. Sun Wipes do not leave a residue like most on the market. • Portable and Convenient - Take them anywhere you go to clean hands, while on the go. Compare to Dymon wipes (72 wipes per tub), Zep's Clean'ems (45 wipers per tub), Brody's Hand cleaner Scrubs (72 wipers per tub).